Join us for Car Seat Safety Tips and a Giveaway with Britax! » Enter our giveaway for a new Britax Infant Car Seat! All Moms are concerned about protecting their families. 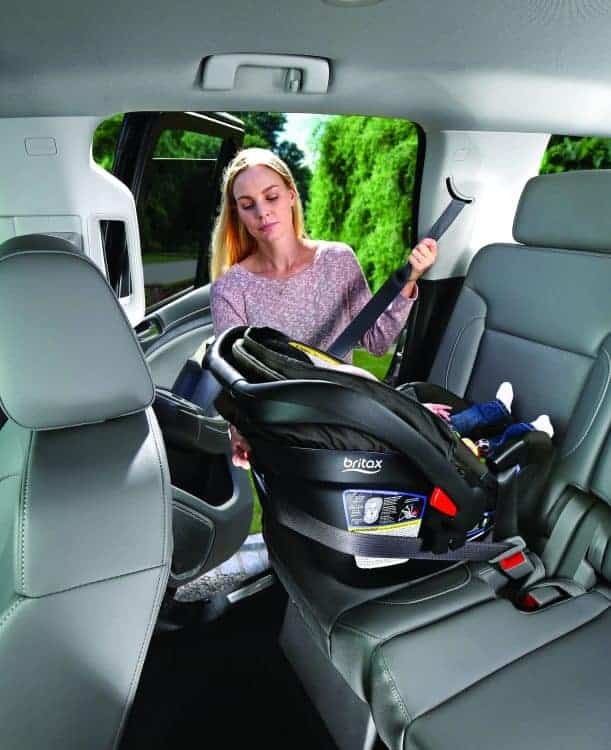 For new Moms and Moms of newborns, toddlers and growing kids it is vital that we find out about child car seat safety and keep updated with new models that become available. Children need to remain in the backseat until they are 13 – did you know that? It’s a great time to remind ourselves about important safety tips, attend a fun event and enter our Giveaway! Remember when you were a new Mom with a Newborn Baby? Or are you Pregnant or have a Newborn and planning ahead to bring your baby home? You might be planning to upgrade your car if you are adding a 2nd, 3rd or 4th child (or even more!) to your family. It takes some research to find the right car for you! We see tons of Moms swapping their suggestions in our Facebook group. It worries me to think that studies show that nearly three out of four children ride in car seats that are either installed or used incorrectly. Are you #RideShareReady? What about if you need to use an Uber or are riding in a Taxi? Do you know how to install the seat you have correctly in someone else’s car without a base? Having representatives ready to demonstrate car seat installations and share their child safety tips in one easy location is a great opportunity! You can leave rest assured that you are equipped with the latest know-how from Britax having seen the latest family-friendly Lexus models that are available. Britax are also going to be showing us the innovative brand new Endeavours Car Seat, which is packed with safety features. Want to win one of eight (8) Britax Endeavours infant car seats? Disclosure: All opinions are those of Plano Moms. This post may contain affiliate links and/or product(s) sent from companies or their PR team for editorial consideration. For more information, please view my disclosure policy. It’s great the Britax is made in the US in SC and that the endeavour is designed to be mobile for city living.